The APTET 2018 shall be conducted ‘ONLINE’ in the 13 districts and centers at Hyderabad, Bangalore and Chennai on the above mentioned dates (i.e. 10.06.2018 to 21.06.2018). A window will be opened to the Candidates from 25.05.2018 to 29.05.2018 to opt the DISTRICT and session in the available centers indicated in the web. 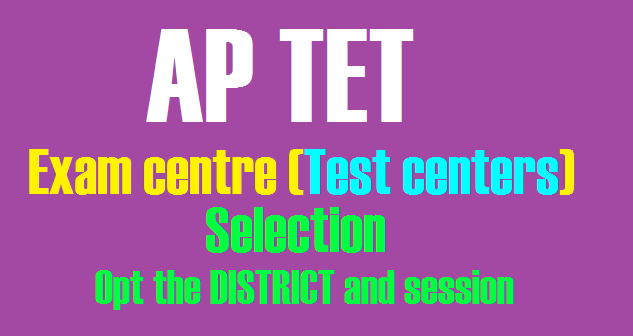 If once the session capacity of the centers is exhausted then the candidate should choose another date and another session at available districts. If the candidate failed to opt Examination centre in the prescribed date mentioned above, department will allot the examination centre in the available vacancies. The final deadline for AP TET application fees is due to end on Tuesday 22-05-2018 at 12 o’clock. Last date for submission of APTET Online applications is up to 23rd May 2018. Upto 21 May evening, 1,41,551 applications for Paper-1, 1,61,571 applications for Paper-2A , 13,608 applications for Paper-2B were received. Opt Examination Center And Session - Physical Education Teacher 25.05.2018 1:30 PM. Help desk: If there are any doubts, helpline numbers 9505619127, 9505780616, 9505853627 can be contacted.